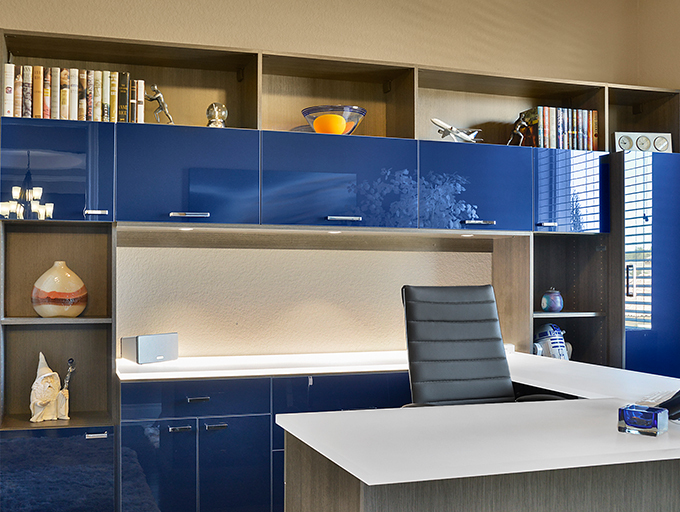 The entire desk space is Lago Milano Grey with Chroma White Out countertop. 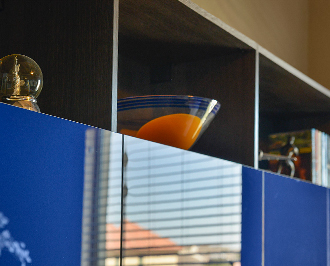 The doors and drawer fronts are Blue Sapphire with steel gloss edge banding. I have a professional background spanning over two decades in the luxury-lifestyle industry, and moving into home-storage design was a natural progression in my career development. 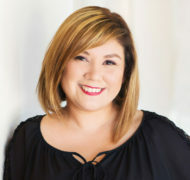 I have been working in people’s closets, specializing in closet audits as a personal wardrobe stylist, helping men and women with wardrobe selection, organization, and design. When you work with me, you will quickly realize it’s not wardrobe-closet audits, but my genuine and friendly ability to relate to my clients, that is my greatest asset, as well as my focus on inspiring those who may have lost hope when searching for a solution. 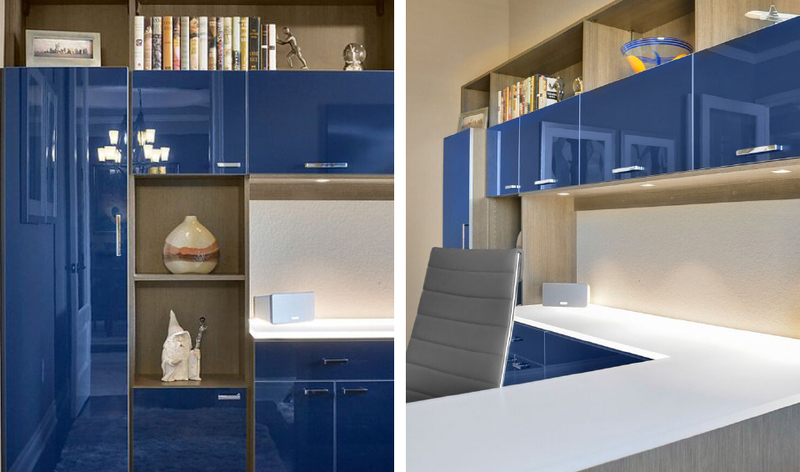 My expertise in working with people’s wardrobes allows me to bring together your objectives and make your organizational design dreams a reality. These visions go beyond “closets.” At the end of the day, I believe that working with you to realize your vision to design your custom-storage solution, enhance your home, and bring you a sense of comfort is what makes my job amazing. Who is the client and what is the style of their home? The client is a professional career driven man who works from home. His style is very contemporary and he liked Italian-inspired design. The original projects were his and his closets, but in conversation, I found out that he had a need for an office. Tell us more about the project. We started off working on the functionality of the space, then played around with multiple finishes to arrive at the final palette. How did you collaborate to create the best possible outcome? How did you involve the client in the process? He showed me a photo of a black high gloss office that he was going to order online. It was obvious that it wasn’t going to serve his specific needs, it wasn’t the right dimensions for his space. I knew that we could do better. I suggested a U-shaped desk that allowed him the additional functionality he was after. How did you use our product – design and materials – to offer value to your client? There was a strong presence of perceived value to our product offering because of our relationship. They had experienced the quality of our process. What he loved most about the final product selection was that he now had something unique, that other people may not have. In what way did you design a better life for this client? Spending the majority of his day here, working from home, now he walks into his space and feels productive. He is happy to have storage that is specific to his needs without clutter.